When incoming invoice is entered the percent upper and lower limits are checked, if a value ( quantity / price ) deviates beyond the limits cause these document was locked and the invoice cannot be cleared in FI . You can manipulate upper limits and lower limits using MM08R002 . 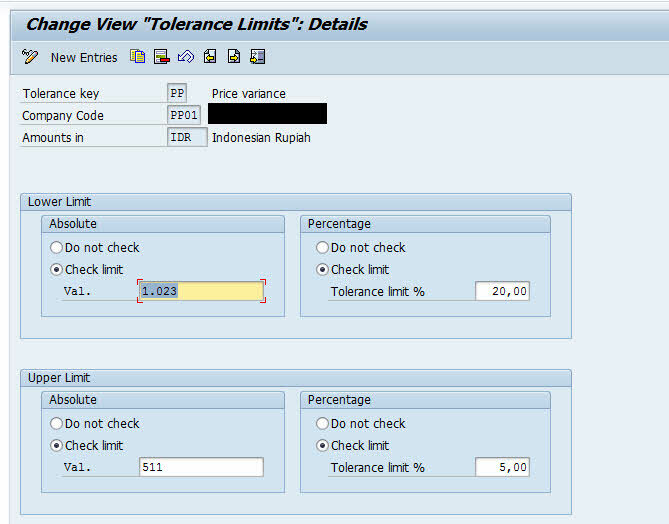 Before using this enhancement to manipulate upper and lower limits you need to configure tolerance limits in customizing via menu path Material Management->Logistics Invoice Verification->Invoice Block->Specify Tolerance Limits. Tolerance key is SAP specified type of deviation between the incoming invoice and purchase order or the goods receipt. When you enter an item in the incoming invoice ( MIRO ) the EXIT_SAPLMR1M_001 or EXIT_SAPLMRMP_001 is called depending on the type of variance, the the EXIT_SAPLMRMC_001 start in which you can redefine the tolerance limits. 1.Go to transaction code CMOD then create the project and include the enhancement MM08R002. 2.Double click on EXIT_SAPLMR1M_001 and write global variable into include ZXM08TOP. DATA : gw_rbkpv TYPE MRM_RBKPV, gw_drseg TYPE MMCR_DRSEG. 3. Activate then back to the user exit and double click to create the include ZXM08U04, and write ABAP Code for transferring the data from the interface to the global structures. *&-----------------------------------------------------------* *& Include ZXM08U04 (EXIT_SAPLMR1M_001) *&-----------------------------------------------------------* *”*”Local interface: *” IMPORTING *” VALUE(I_RBKPV) TYPE MRM_RBKPV *” VALUE(I_YDRSEG) TYPE MMCR_DRSEG *” EXCEPTIONS *” CALL_FAILURE *”------------------------------------------------------------ gw_rbkpv = i_rbkpv. gw_drseg = i_ydrseg. 4. Back to the user exit EXIT_SAPLMRMP_001 and double click to create the include ZXMo8U17, write ABAP code to transfer the data of the interface to global data . the ABAP Code is similar with ABAP Code in ZXM08U04 before. 5. Go to EXIT_SAPLMRMC_001 and create the include ZXM08U19, in this user exit have two import parameters – company code and the the tolerance key. The new tolerance limits can be specified using E_XW1JA, E_XW2JA, E_XP1JA, and E_XP2JA. and place flag ( X ) into E_CHECK to apply your new limits from user exits. *&-----------------------------------------------------------* *& Include ZXM08U19 (EXIT_SAPLMRMC_001) *&-----------------------------------------------------------* DATA lw_t169g TYPE t169g. IF i_tolsl = ‘PP’ AND gw_drseg-matkl = ‘008’. SELECT SINGLE * FROM t169g INTO ls_t169g WHERE bukrs = i_bukrs AND tolsl = i_tolsl. * Assign absolute limits from Customizing / SPRO e_wert1 = ls_t169g-wert1. e_wert2 = ls_t169g-wert2. e_xw1ja = ls_t169g-xw1ja. e_xw2ja = ls_t169g-xw2ja. * Increase percentage variance e_proz1 = 3. e_xp1ja = ‘X‘. e_proz2 = 3. e_xp2ja = ‘X‘. * Use change ( required to X ) e_check = ‘X‘. ENDIF. IF i_tolsl = ‘PP’ AND gw_drseg-matkl = ‘008’.